At Taste the Cracklin we have provide our services across the UK, which means that you can find our delicious hog roast near you. This is especially the case if you’re looking for a hog roast caterer in Ribchester, you’ll find us right here providing a group of lucky people with some of the most delicious meats, all slow cooked and dripping with flavour. You will find that we offer an excellent service, all the food we provide is sourced locally and cooked fresh on-site to ensure the very best food. We provide two different styles of catering formal and informal to suit the style of the event. We have a number of different menus to suit corporate events, parties, and weddings from an informal hog in a bun buffet to a formal 3 course sit down meal. The choice of menu and catering options are dependent on what you want, and we provide a number of menu options to ensure you and your guests get exactly what they want. We can cater to any dietary requirements and always provide a vegetarian option, so there is no reason why you can’t choose catering that you love for your event. 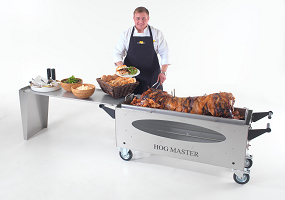 A hog roast looks great while it is cooking, many people like to watch a hog roast cook because it is unlike anything that they have seen before. Even if you do not like pork, there is nothing stopping you from choosing from other options such as lamb and spit roasted chickens.